Is it just me or is collecting acorns seriously addictive? I can’t go out at the moment without returning with pockets stuffed full of acorns. I thought I’d offload some on the school gardening club but I was greeted with looks of horror all round when I announced we’d be planting tree seeds. A group of forward-thinking 7 year olds demanded to know exactly what we were going to do with all those oak trees. A very good question (that’s what I always say when I’m stumped for an answer and playing for time) which needed a convincing answer. So…. Firstly, it’s unlikely that all the acorns will germinate. Secondly, if there’s a squirrel within a 50 mile radius, we’ve got a battle on our hands. Thirdly, as we’re growing the trees in pots, the probability of keeping a small tree alive for a couple of years before it’s big enough to be planted out is around 20%*. Fourthly, even if we decide to compost the young trees before they get too big, we’ve still learned a lot from collecting, planting and tending the seeds, not to mention thinking about plant life cycles. Fifthly, we have a tree nursery at school for small trees that pupils don’t want to take home. Those that eventually get too big for the nursery will either be planted in the school grounds, or donated to the local gardening college or park. That seemed to do the trick (phew), we planted our acorns and nearly all of them took the pots home. If you’ve never tried planting tree seeds before, release that inner squirrel and give it a go. 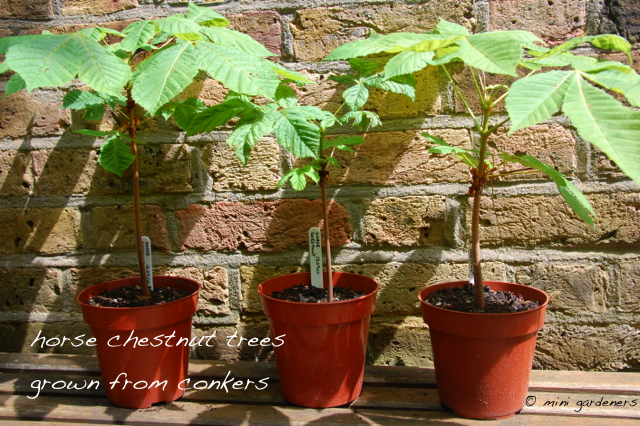 Acorns, conkers or sweet chestnuts are all good for beginners as they tend to have reasonable rates of success. Collect the plumpest seeds and discard any that show signs of damage (harsh, but it’s survival of the fittest). Plant straight away. All these seeds can die if they’re allowed to dry out. If you want to show off, the technical term is “recalcitrant seed”. Try the sink or swim test before planting, to select seeds which have the best chance of germinating. Remove anything that isn’t seed i.e. 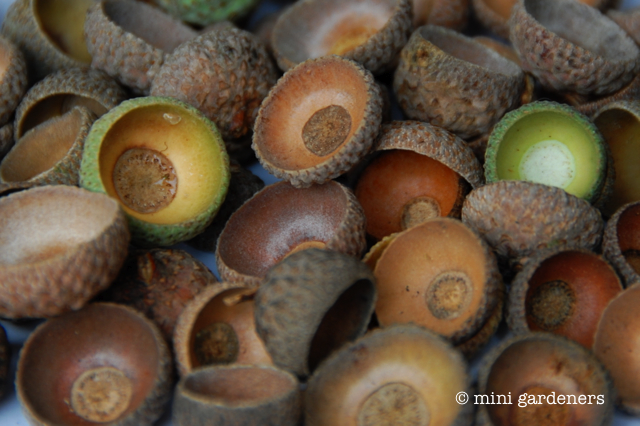 acorn cups, conker and sweet chestnut casings. Plant in a small pot (must have drainage holes) and ensure the seed is covered with its own depth of compost. Or plant directly into the ground if you prefer. Water and cover with some sort of netting, otherwise the squirrels WILL find them and steal them. Leave outside to experience the full extremes of winter weather. Shoots should appear some time in the spring. And finally, I leave you with the results of the most glamorous acorn competition. 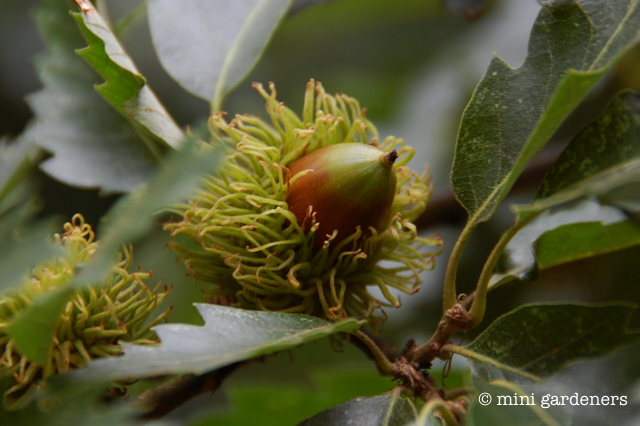 I think this is the Turkey Oak (Quercus cerris), or a hybrid of the Turkey Oak, and we’re loving those frivolous, frilly acorn cups. * An entirely made up figure but you can’t beat a well-placed statistic. 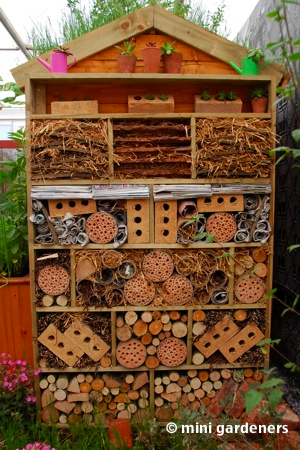 Categories: projects, school gardening, wildlife | Permalink. I am not, by any stretch of the imagination, a domestic goddess. The last time I saw the bottom of the ironing basket was early 1992. 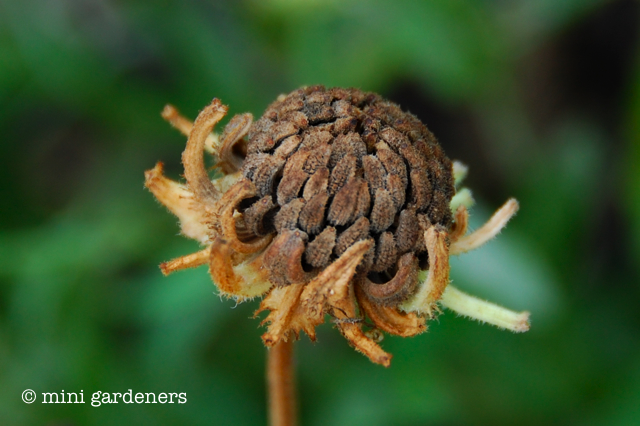 And the garden has an abundance of withered seed heads like the one above. So imagine my delight to discover that being untidy in the garden is a good thing. Oh yes. If you’re racing round the garden like a whirling dervish busily deadheading, raking and tidying (you know who you are), you’re not doing the local wildlife any favours. Instead of a perfectly manicured garden, you should be aiming for undisturbed piles of twigs and leaves, decaying seed heads and the more nooks and crannies the better. Another advantage of being slovenly in the garden is that you can collect your own seed, not only saving yourself a fortune but keeping lots of children entertained in the process. 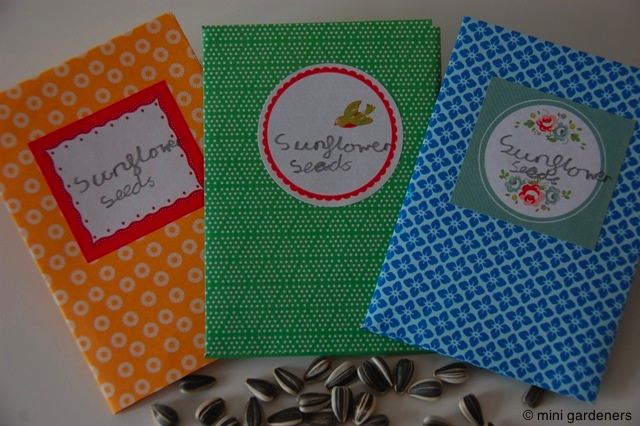 Sunflowers are also good candidates for seed collecting with children, if you can get to the seeds before the birds. 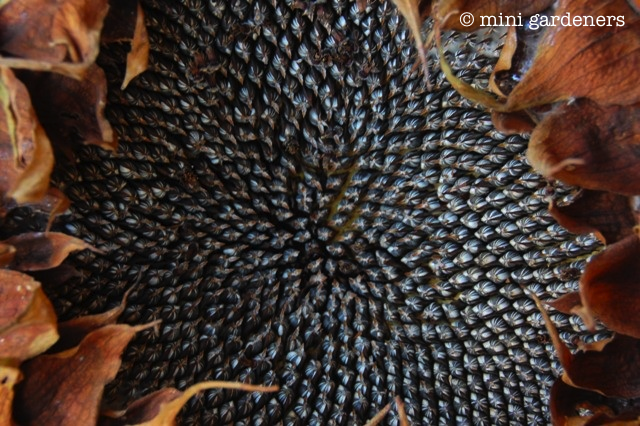 Useful if you have a large group of children, like a school gardening club, as each sunflower head has hundreds of seeds. 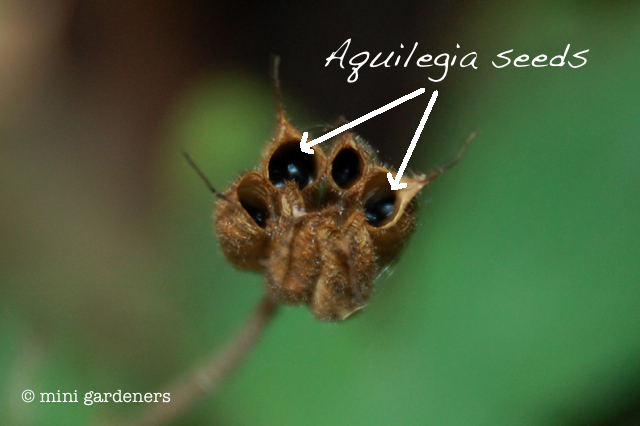 A pair of tweezers can be handy for extracting the seeds. The Aquilegia and Delphinium seed heads in our garden passed the looks-awful-ready-for-collecting-seed rule of thumb too. These were tricky as the slightest touch to the seed head sent sprays of seeds flying everywhere. In the end we had to resort to putting a paper bag over the seed head before cutting from the plant in an attempt to contain the chaos. 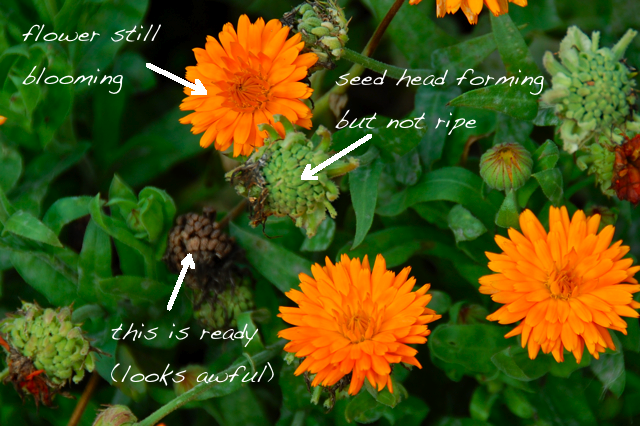 Some of our seeds may not produce flowers that are identical to the parent plant. I can’t remember whether the delphiniums were F1 hybrids. If so, they definately won’t produce identical plants but for us this isn’t important. Before storing, we separated the seeds from the chaff (the delightful technical term for all the rubbish that isn’t seed) and then left the seeds indoors to dry for a couple of days. This was a perfect opportunity to make some more seed packets to store our seed until the spring. Full step by step instructions can be found here. Damp and warm are the joint enemies when storing seed as this will encourage them to germinate or rot. So when the seeds are safely tucked into their packets we’ll find a cool, dry place to store them i.e. not a warm, steamy kitchen. And the final task (sometimes the trickiest, I find) is to remember where you stored the seed packets so you can find them again next spring when it’s time to sow. Categories: flowers, projects, school gardening, sunflowers, wildlife | Permalink. Oprah Winfrey has an irrational fear of balloons. I know this because I pick up all sorts of useful information listening to the car radio on the school run. I’m very comfortable around balloons but I’m not keen on spiders and I seem to have passed this irrational fear on to my daughters. Late summer is not a good time for us arachnophobes. 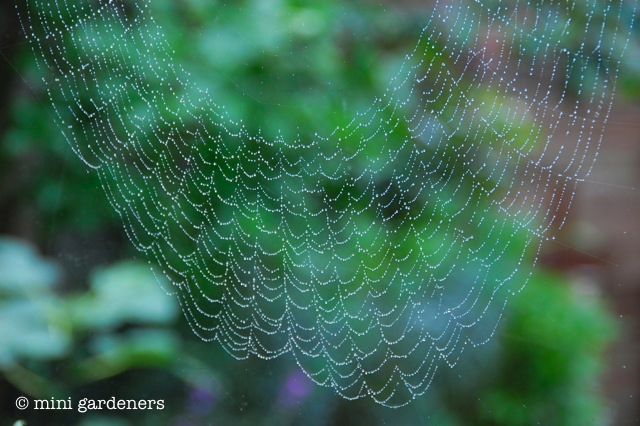 Everywhere you turn in the garden there’s a spider’s web. Plus the entire spider population of west London is now using our house as a meeting place. Or so it feels. Thank goodness I’m not a single parent otherwise I wouldn’t be able to get through the front door for upturned glasses. And to add insult to injury, we came down to breakfast this morning and a huge spider had created an elaborate web just outside our kitchen window (photo above). I think they’re mocking us. I feel certain they’re running all over our faces while we sleep. 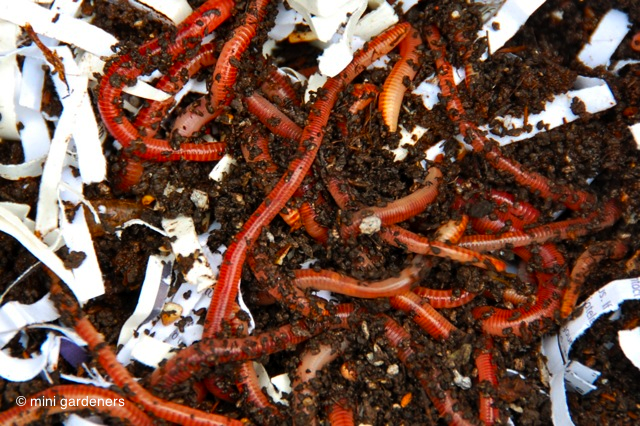 Look away now if you’re squeamish about worms….oops, too late! Today we took delivery of a new batch of worms for our wormery. The last inhabitants drowned (please don’t report us to the RSPCA) because the rain cover blew off the wormery and hasn’t been seen since. The worms arrived through the post in a plastic pot which rather alarmingly had “microwaveable” written on the lid. The picture above shows them just after they were introduced to their new home; for the avoidance of doubt, no microwaving was involved. Two minutes later they had burrowed into the bedding of moist compost and shredded paper. So January is finally over, the bleakest month of the year apparently. But we quite like January. It has its highlights; snow, sunny days with clear blue skies and the fact that you can hibernate without guilt after 4pm because it’s getting dark. In fact the only problem I have with January is finding indoor activities for school gardening club when we can’t go outside because a) snow is covering the ground, or b) it’s raining, or c) it’s icy. 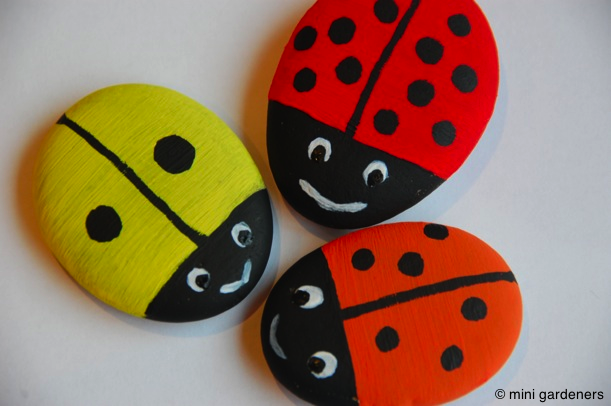 And the latest addition to the list is turning pebbles into ladybirds to use as decorations for the garden. If you’re crafty you can even sneak in some educational bits without anyone realising – ladybird anatomy and the useful role of ladybirds in the garden. Categories: education, projects, uncategorized, wildlife | Permalink. If you’re in the UK this weekend you’ll be able to take part in the world’s biggest wildlife survey. 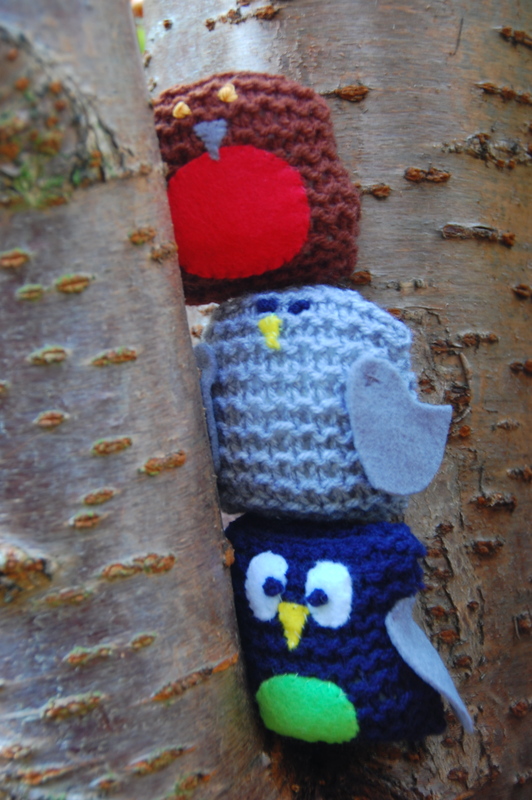 All you have to do is watch the birds in your garden or local park for one hour over the weekend of 26 – 27 January 2013 and send the results to the RSPB. Over half a million people are expected to take part in this 34th Big Garden Birdwatch and the RSPB will use the information to continue to monitor bird populations in the UK. Check out their website for full instructions and some interesting statistics from earlier surveys. As well as providing some useful data, it’s a good excuse to swot up on your bird identification skills (I’m off to start revising right now). Schools are also invited to take part between 21 January and 1 February 2013, and the RSPB website has lots of downloadable resources to help. Happy birdwatching! Categories: school gardening, wildlife | Permalink.